View More In Sun Hats. It is very important for girls/ladies/women to protect themselves from directly strong sunshine. The sunshine ultraviolet ray will do harm to your skin, makes dark spots, accelerate aging, even cause skin cancer. It is necessary to use a sun protective hat when you are outside in the summer. This sun hat has UPF 50+ sun protection, can protect you from ultraviolet ray. Fashionable, trendy and easy to carry. Adjustable with the velcro on the back for a comfortable fit. The wide brim protects your eyes and face from the intense sunlight. The open-top design is perfect for anyone who wears their hair up or in a ponytail. This hat is fully adjustable and easily stores in any large handbag or backpack. SUITABLE SIZE: This sun hat has one size fits most women. Head Circumference: 22.6"; Brim Width: 4.5"; Hat Height: 3.5"; The caps have velcro tabs in the back which make them very adjustable. EXCELLENT DESIGN: The floral leaf pattern underneath the brim makes it very stylish and different from ordinary ones. Nice top open design, give a better breath to your head and hair as a visor, doesn't feel stuffy in the hot days. DETACHABLE CHIN STRAP: The sun hat comes with the adjustable chin strap, can be attached to both side, to keep the hat from flying off in the wind. If not need, you can also take it off. 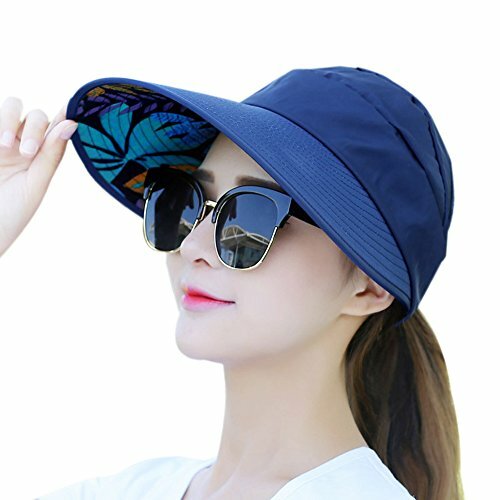 SUN PROTECTION: 360 degree protection outdoor sun hat with windproof, UV, breathable, quick-drying, ultra-light material is worn all day. Wide large brim provides a perfect shade to your face, help protecting from the sun's harmful rays. Keep healthy forever! FUNCTIONAL: A perfect hat for wearing when gardening, glof, camping, hiking, fishing, shopping or any outdoor activities. Foldable brim make it easy to carry, hiding it in your luggage or backpack when you're on the go or simply roll it up and put it in your bag. If you have any questions about this product by Muryobao, contact us by completing and submitting the form below. If you are looking for a specif part number, please include it with your message.